For two weeks beginning on Thursday, September 14, an autumn market selling Czech traditional fare and wooden toys will appear on Wenceslas Square as part of a celebration leading up to the feast of St. Wenceslas, patron saint of Bohemia. Apart from stalls, weekend cultural programs are planned with performances and, on the 28th, a processional of jugglers, dancers, and knights on horseback in period costumes, featuring an appearance by the good King himself at 2pm and 4pm. The festival culminates on the Thursday, September 28th Czech Statehood Day, a national holiday which commemorates his death on this same day in 935, at the command of his own brother who disagreed with Wenceslas’ pro-Christian policies. 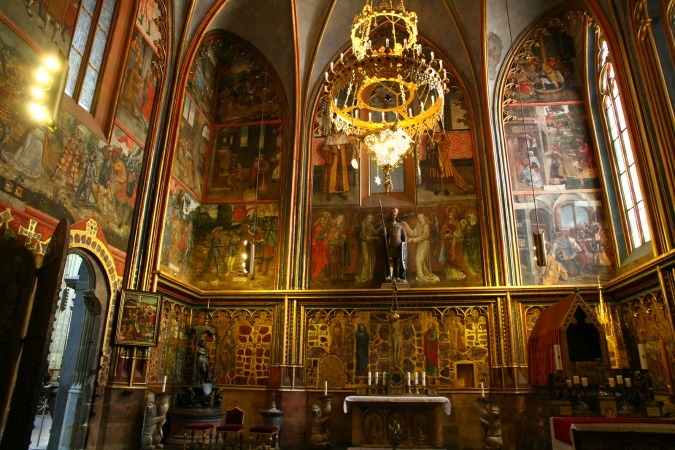 After his murder, Wenceslas became a symbol of Czech statehood and a Catholic saint revered throughout the Bohemian lands and beyond. An altar has been devoted to him in the Basilica of Saint Peter in the Vatican since the beginning of the 14th century. He is depicted throughout legends and chronicles as a virtuous ruler, an educated and distinguished politician and statesman who destroyed pagan temples and grew grapes for the production of sacramental wine at Prague Castle where he founded the Rotunda of St. Vitus, the basis for the cathedral that houses his tomb today. Although during his lifetime, Wenceslas was only a duke, Holy Roman Emperor Otto posthumously conferred the title of King on the martyr which is why he is referred to as a king in the famous Christmas carol—and the campy 1994 film about his life. Prague legend says that when the motherland is close to ruin, the equestrian statue of King Wenceslas in Wenceslas Square will come to life, raise the army sleeping in Blaník, and upon crossing the Charles Bridge his horse will stumble over a stone, revealing the legendary sword of Bruncvík. The market runs until September 29. Additional details about the celebration can be found here.